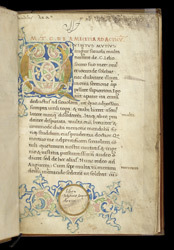 The manuscript begins with Cicero's 'On Friendship', which gives an account of the friendship of two statesmen that Cicero heard of from his mentor. It is also is a tribute to his own friendship with Titus Pomponius Atticus, to whom Cicero dedicates the essay. The blank circular area in the lower part of the border was meant for the owner's coat of arms, suggesting that the manuscript was made speculatively for sale. A 16th-century owner, John Stone "cleric", inscribed his name in the blank circle, and a 17th-century owner, William Somerscales (or Somerseales), wrote his name over an erasure in the upper margin. In the 18th century, someone wrote 'Herodotus' in the upper left corner.